Ted Johnson wrote this memo as he was leaving Microsoft following his 3 year 9 month tenure, most of it as head of Microsoft’s Business Tools Division of which Visio was a part. Johnson had assumed that role in mid-2000 when Jeremy Jaech left Microsoft following the acquisition of Visio. The tone of the memo reflects Johnson’s personal feelings of guilt that the acquisition had not achieved the revenue goals originally expected of it. Years after writing this memo, Johnson came to learn that Microsoft considered the Visio acquisition among the most successful they had ever done. Moreover, Visio’s revenue was on an upswing fueled in part by the Sarbanes–Oxley Act, which indirectly increased the use of flowcharting for documenting corporate procedures and controls. This memo contains reflections on Microsoft’s acquisition of Visio Corporation and summarizes some of the lessons learned by the author, one of the acquisition’s primary participants. The following timetable may help set the context for items discussed in this memo. The line chart in the background is the NASDAQ composite index. Visio’s stated motivation for the deal was to increase the sales and marketing reach for its Visio family of business diagramming and technical drawing products. 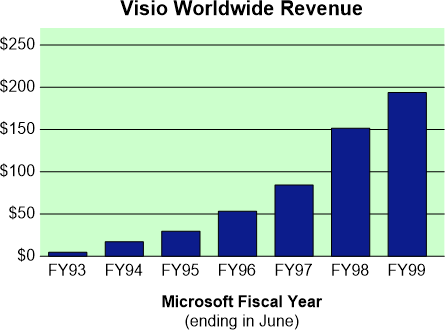 In the end of 1998 and early 1999 Visio management faced the decision whether or not to build up substantially its worldwide sales and marketing teams. While we felt we had the talent and resources to do so, we also believed that corporate sales excellence was unlikely to be a distinctive competence of Visio Corporation. Moreover, we knew that a larger sales force would soon demand a larger portfolio of products to peddle. That would likely start us down the path of acquiring products and companies so we could increase our offerings quickly. Having stumbled badly with the acquisition of IntelliCAD in an attempt to expand into the 2D CAD market segment, this was not a direction Jeremy Jaech or I wanted to pursue. With the support of Visio’s Board of Directors, Jaech approached Microsoft about acquiring Visio. There were additional unstated motivations for pursuing an acquisition. The quarterly pressures of running a publicly traded company are substantial. Though Visio had enjoyed consecutive quarterly growth in both revenues and earnings since going public, it was only a matter of time before we would break that pattern. On the product side, we felt we had already delivered more functionality than our sales and marketing teams could effectively promote. The diversity of the market segments Visio attempted to serve exacerbated the problem. Pouring even more into the product was not likely to grow the business. As mentioned above, our attempt to enter the Autodesk-dominated 2D CAD market was a failure. We were out of ideas. Finally, both Jeremy and I were approaching our 9-year anniversaries with the company. There were no obvious internal successors to either of us. An external search to fill either of our jobs was not something the Board of Directors looked forward to; filling both our jobs in close time proximity would have been very disruptive. On a personal level, Visio’s acquisition would provide a mechanism by which Jeremy and I could move beyond our Visio jobs while knowing the product would go forward and its customers taken care of. Companies can view acquisitions in one of three ways: acquisitions of revenue streams, acquisitions of people, or acquisitions of technology. Successful acquisitions can be of any of these types. My understanding of Microsoft’s motivation for acquiring Visio was to add a fast growing revenue stream to its desktop applications business. 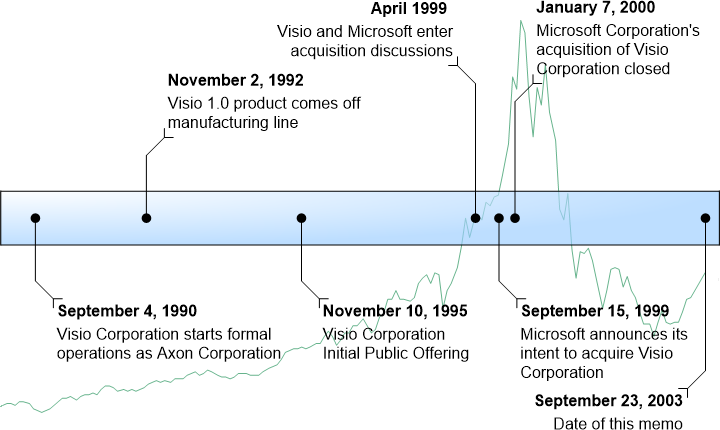 While the company had done many prior successful acquisitions of people and technology, Visio was Microsoft’s first acquisition of a substantial ($200 million annualized) worldwide revenue stream. Preserving and growing that revenue was, at least in Jeremy and my minds, job one. Microsoft’s enterprise marketing activities and specialist sales teams—both at the time of the Visio acquisition and today—organize around three customer audiences: the information worker, the IT professional, and the developer. These groups largely promote the products of the Office, Windows Server, and Visual Studio business groups, respectively. Visio, however, had functionality that appealed to users in all three of these segments. The Visio Standard product, which was licensed in the highest volume, targeted information workers. The Visio Professional and Visio Enterprise products targeted developers and IT professionals with networking professionals being an especially strong segment. Visio Technical targeted non-IT engineering users. The Microsoft user taxonomy does not specifically call out these engineering segments but as they are also users of Microsoft Office and Microsoft Project, they fit under the information worker umbrella. Microsoft and Visio management made the decision to align Visio with the information worker audience and to combine it with Microsoft Project in a newly formed Business Tools Division. I believe this was the best decision to preserve and grow Visio’s revenue stream. Over time, this alignment has caused Visio to shed its developer- and IT professional-specific functionality and has undoubtedly had an impact on revenue growth. Yet, given the celebrated challenges working cross group at Microsoft, I think Visio did as well as one could expect. Were Bill Gates’ Expectations Different? Comments by Bill Gates since the acquisition have made me question the two above assumptions: (1) that Visio was a revenue-motivated acquisition and (2) that its best alignment was with the information worker audience. The ambiguity surrounds whether Visio should have or could have (a) been a better provider to technology to other groups, specifically developer tools, and (b) more aggressively pursued the networking professional segment. I agree that both of these would have been desirable side benefits of the acquisition but I have never believed they were drivers of the deal. If they were, it was not clear to me. As the line chart under the timeline on the first page of this memo shows, the summer of 1999 was a unique time to be negotiating a deal. The NASDAQ composite was enjoying the irrational exuberance of the dot-com bubble. Microsoft’s own stock performance was outstripping the composite. They were heady days. No one predicted the crash in technology investment that was to come in 2000 and 2001 though everyone knew the good times were not going to stay this good. Visio, too, was enjoying solid financial performance. Shown below is its worldwide revenue through June 1999 on a Microsoft fiscal year basis. Based on this historical performance and unable to foresee the tech wreck ahead, Microsoft’s financial analysis predicted strong future revenue growth for Visio. The revenue forecast for FY00 through FY03 was $257, $344, $462, and $611 million per year, respectively. 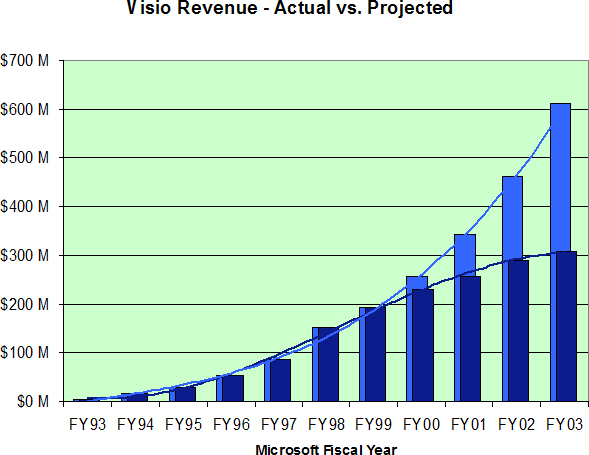 The actual revenue achieved since the acquisition has been substantially less than that forecast in the summer of 1999 (dark blue is revenue achieved by Visio Corporation; light blue by Microsoft). While not bad performance, the growth rate has indeed slowed. Juxtaposed against the original exuberant forecast, however, the achieved revenue appears lame (achieved in dark blue; forecast in light blue). I look at this and conclude that while Visio revenue could have been stronger over the last three years, its actual performance hasn’t been so bad. The original forecast was a sign of its time. Substantial upside opportunity remains untapped. Only this fall with the launch of Visio 2003 does Visio have a clear go-to-market message that can be carried forth by the Business Productivity Advisors. Only now with the marketing of our entire information worker product portfolio under the Microsoft Office System brand does Visio have a good chance of being promoted by our account representatives alongside our other productivity products. Only recently has Visio had a Microsoft-experienced product management team who can effectively construct the selling messages for the field. In most international subsidiaries, Visio lags behind the level of performance we should expect by extrapolating from Office’s performance in those countries compared to its performance in the US. The following chart shows Visio’s FY03 billed revenue achievement relative to Office’s achievement in the top 12 (by revenue) sales locations outside the US. 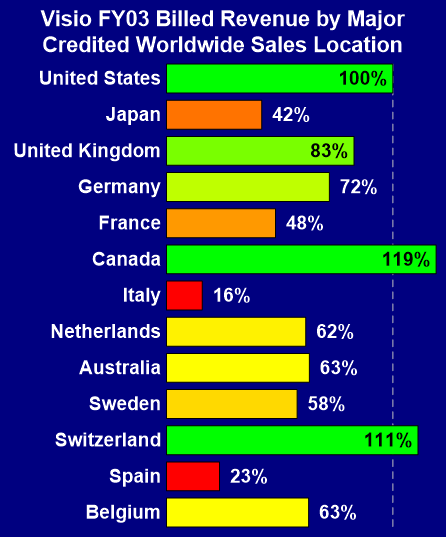 In this analysis, each sales location’s revenue is first expressed as a percentage of US revenue. Then Visio’s percentages are expressed as percentages of Office’s percentages. All revenue sources are included here including Academic, OEM, and PIPC. As you can see, Visio performs well only the UK, Canada, and Switzerland. Its performance in Japan has historically been stronger but Visio has struggled in Japan in the recent year as many customers in Visio’s core market segments reduced spending. Bringing all of these geographies more in line with the performance of Office in those countries would yield substantial increased revenue. In addition to improving sales and marketing execution outside the US, much can be done to improve Visio’s execution across its various customer segments worldwide, the US included. A recent study conducted on behalf of the product management group shows that Visio’s appeal is not uniform across industries or user departments. By focusing the sales efforts of the BPAs on those segments where Visio is most successful, the penetration of Visio in those segments can be substantially increased. Finally, there is the opportunity to expand into additional user segments where Visio is not strong. Today Visio’s primary users are in what McKinsey & Company dubbed in a summer 2002 study as “technical/vertical experts.” This set of users was estimated to be approximately 18% of all knowledge workers. The same study identified an equally large set of users McKinsey called “business experts” who have demanding graphics requirements unmet by the features and capabilities of PowerPoint or Visio. By focusing on these users’ needs with Visio 12, there is the possibility to double number of knowledge workers to whom Visio appeals. Coupling better execution in the technical/vertical segments with more consistent execution around the world and product enhancements to appeal to the so-called business experts, Visio could become a the $1 billion brand Jeremy and I believed it had the potential to be. In the summer of 1999, employee retention was a big concern of Microsoft’s. Knowing that technology without the people who create it is largely worthless, Bob Muglia placed a high priority on retaining Visio employees in the product development division. Jeremy and I set the goal to recruit 100% of the product group employees to Microsoft. This included the functions of development, test, program management, user assistance, design, usability, and localization. We largely achieved this goal with over 99% acceptance in these functions. Product support also initially retained a large number of its employees. Other groups, however, fared less well, especially sales and marketing roles outside of Redmond. Others have analyzed the factors that contributed to the failure of Microsoft to recruit a high percentage of the most talented sales people. Two factors stand out in my mind, neither of which the company could have done much about. First, the cash compensation offer was simply not good enough. Visio had a highly leveraged commission model; our top performers made a lot of money. Microsoft’s sales compensation was not as generous at that time and making exceptions to accommodate 100 or so salespeople was not reasonable. Second, this deal was happening at the top of the Internet bubble. Good salespeople found it very easy to land what appeared to be great jobs elsewhere. The fact that many of these companies would be closing their doors six to twelve months down the road was not apparent in January 2000. Microsoft could do nothing about this factor. In retrospect, the emphasis we placed on retaining 100% of the product group had its downside. Similarly, our inability somehow to retain the bulk of the Visio-experienced sales force had a negative impact on revenue we didn’t fully appreciate at the time. Our retention efforts were imbalanced. Employees did not feel “recruited” by Microsoft. This eventually contributed to a sense of doubt about whether they were really wanted. Long-term retention of the best Visio employees has not been strong. Most senior Visio developers have left the Visio group with many leaving the company. None who left the Visio group but stayed in the company stayed within the greater Office organization. I do not fully understand the reasons for this. Many folks who have left and who discussed their leaving with me cited the different cultures between Visio and Microsoft. I confess that at the time of the acquisition, I didn’t perceive the cultures to be that different. What I’ve learned since through the Leadership Development Group’s Merging Cultures class is that Visio had what William Schneider describes in his book The Reengineering Alternative: A Plan for Making Your Current Culture Work as a cultivation culture, one that values personal relationships and strives to bring new possibilities to market. By contrast, Microsoft has a competence culture, also driven by delivering the possible but much less concerned with personal relationships and the cultivation of its employees. The Office organization shows characteristics of a control culture, characterized by a desire to deliver safe products on a predictable timetable. Schneider points out that none of these cultures is bad. 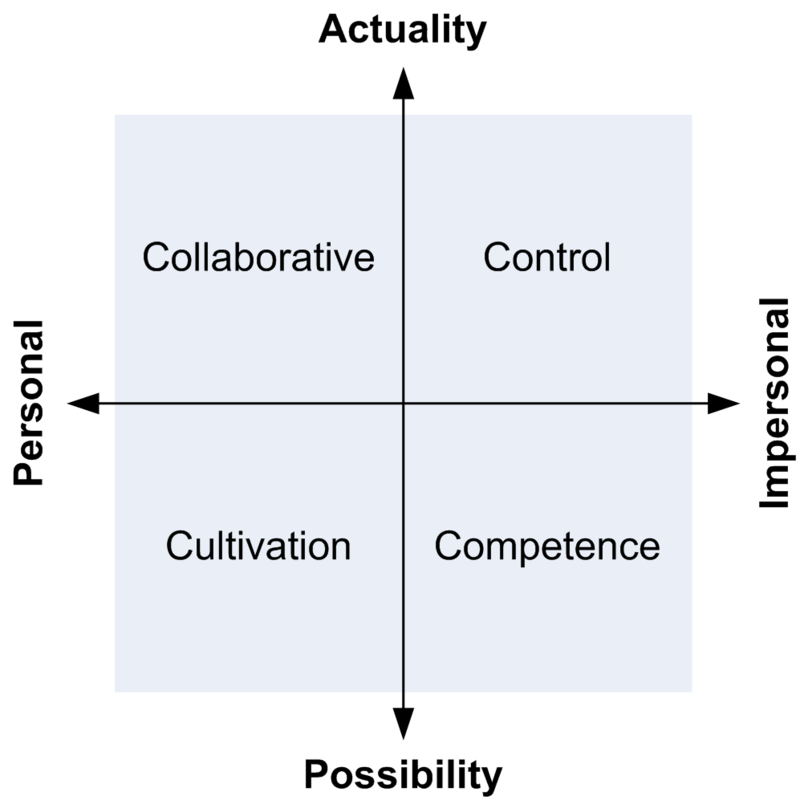 Successful companies exist in all quadrants and most have both a dominant and secondary culture at work. Microsoft, however, is strongly rooted on the right side of this matrix. 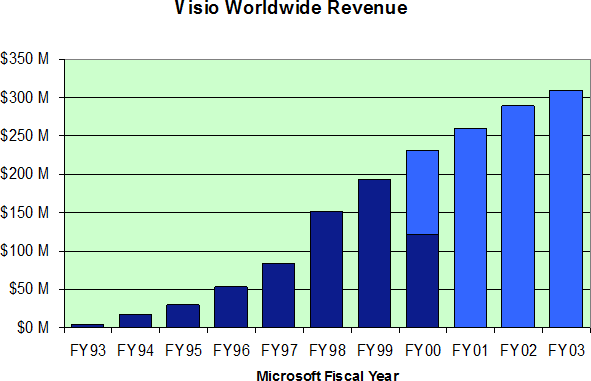 Visio was largely on the left. The tension between these two extremes has caused many people discomfort. No place is that discomfort more visible than in performance reviews. Visio’s performance reviews had many things in common with Microsoft’s but differed in one key way. Rather than manage the distribution of ratings to a curve, we managed to a group average rating. I recall these group averages being between 3.55 and 3.60 on the same scale Microsoft uses. This is surprisingly similar to Microsoft where this year’s BTD average review score was 3.554. The difference was that Visio managers achieved this average with many more 3.5 ratings and many fewer 3.0s and 4.0s. Within Microsoft, Visio managers find it nearly as hard to give 35% of their employees 4.0 or higher ratings as they do to give 25% of them 3.0s or lower. The anxiety around the curve—on both ends—is substantial. This is not an indictment of Microsoft’s performance review system. As I have learned to apply it better, I’ve become quite a fan. I note only that it was one of the biggest differences employees experienced as part of the acquisition. I believe the acquisition of Visio and the formation of the Business Tools Division had an overall positive impact on Microsoft’s information worker business. The challenges we experienced bringing on board the Visio sales team highlighted the fact that the company had nearly no one focusing on selling its information worker products. The headcount allocated as part of the Visio acquisition created the BTD Sales Specialists positions around the world. At the start of FY03, these 80 or so BTD Sales Specialists formed the nucleus of the new Information Worker Business Productivity Solutions Group with its Business Productivity Advisors and Business Productivity Specialists. These specialists were particularly important to Project as we introduced Project Professional and Project Server 2002. Had we not had a team in place we could train on the solution selling of these products, the Project business would certainly not be in as strong a position as it is today. The formation of BTD allowed us to merge the separate localization, user assistance, design, and usability teams of Project, Visio, and Publisher into BTD-wide functional groups. This greatly aided the merger of BTD into the Office organization as the product-to-functional organizational shift had already been done. The need to market Project and Visio alongside Office caused us to rethink the organization of our product management group and paved the way for the Office System branding being introduced with Office 2003. The date-alignment of all the BTD products with the release of Office 2003 allows us to launch the entire family of products simultaneously under this new nomenclature. While it’s too much to credit either the Visio acquisition or the formation of BTD with this, it has been encouraging to see the evolution of the information worker business over the last four years. In 1999, the then-knowledge worker business was defined largely as “Office.” Today it consists of a portfolio of products—some new, some old, some niche, some broad, some client, some server—but all of which share common characteristics and technology and can form the basis for good growth into the future. I turn now from recalling experiences of the acquisition to sharing lessons learned. Four points stick out as things I’d do differently from my point of view as a Visio executive. As stated above, I believe that by not interviewing, stack ranking, and doing a curve-based performance assessment, we missed an opportunity to weed out low performers, ensure that employees are properly leveled, and make those we offered jobs feel “recruited” by Microsoft. Despite the work involved with doing this for 400 or so employees, I believe it would have been a worthwhile exercise. I would do it in stages, getting the managers on board first and training them in the Microsoft performance review process. We would then go through an August-like review cycle prior to offering the employees jobs. Senior management of the acquired target would need to buy in fully to this. The clarity with which Steven Sinofsky manages the review process in Office is a good example of how this should be done. Specifically with regard to Visio, we should have sought clarification on the various market segments in which we sold Visio. As mentioned above, the various Visio editions appealed to information workers, developers, IT professionals, and non-IT engineers. Better up-front planning on which of these segments to emphasize or deemphasize would have allowed us to make better resource utilization decisions in development, marketing, and sales. Recognizing that one of these segments, non-IT engineers, had little overlap with Microsoft’s other products would have allowed us to either explicitly invest in this segment or exit it more quickly. Acknowledging that different product marketing groups target the information worker, developer, and IT professional audience would have forced us to gain cross-group commitments and not assume that all parties would have an automatic incentive to help make Visio a success. More than anything, I wish we had demanded a clear definition of success for the acquisition. Was it technology? Was it revenue? Was it employee retention? What would be the measures of success? Then we could have determined whether we were prepared to achieve that success and, if not, ask for appropriate support. As it stands today, I feel that the conventional wisdom within the company is that the Visio acquisition was a failure. But a failure measured against what criteria? Switching hats now, I pretend that I am an executive on the Microsoft side of this deal but one who has the benefit of having gone through it from the other side. Here is what I would do differently. It is very important that Microsoft have an independent view of how to grow the business if revenue growth is a goal. It is not possible for the acquired entity to understand how to best utilize the considerable assets of Microsoft. It really takes an insider to do that. The field assets must be effectively harnessed to simply sell more of the same product. That’s the easiest money. Down the road, Microsoft’s technology breadth should allow the acquired product to expand into new segments but that takes understanding of the overall company product road map. We have to assume the acquired company doesn’t have that knowledge. Microsoft hates technology redundancy but it is almost guaranteed that the technology assets of an acquisition will initially increase that redundancy. We should have a roadmap to eliminate it going into the deal. This will allow us to make the right organizational decisions and even the right hiring decisions. Again, the acquired company cannot know all the various projects and initiatives going on within the company. It takes a Microsoft insider to plan a roadmap of the acquired technology. The fact that I sit here four years after the deal was announced and still be unclear what goals Microsoft had for the deal is evidence that there was some lack of clarity around those goals and, consequently, the definition of success. This, therefore, is a key point: Know why we’re doing the deal, be clear what success looks like, and be sure we’re equipping the team to achieve the goals. In the case of Visio, if revenue growth was indeed the primary goal, then we should have paid much more attention to the integration of sales and marketing. We should have reduced headcount in the product development areas and invested the savings in those areas. We should not have diluted the Visio sales efforts by adding Project to the mix without a proportional increase in resources. We should have worked much harder to retain sales leadership in key geographies and recruited strong leaders in emerging markets. And we should have invested heavily in the ongoing promotion of Visio via advertising, trade shows, and seminars. If, on the other hand, the goal of the acquisition was technology integration, we should have sooner integrated the Visio team with the Office organization and gained technology synergies as early as Office 10. Even this presumes the information worker was the target market. If general technology sharing was a goal, perhaps Visio should have been organized into the developer division and its strengths in that segment exploited. I don’t know whether the acquisition of Visio was a good thing for Microsoft. I do think it was in the best interests of Visio’s shareholders, customers, and employees—the constituencies I represented as part of Visio Corporation. I do think Visio should have contributed more to Microsoft over the last four years. More revenue. More technology. More customer insight. More good people moved into other areas of the company. For the variety of reasons outlined in this memo, those things have not occurred. Perhaps they will in the coming years. The most important lessons I take away from this (from Microsoft’s point of view) is: don’t buy something you don’t want; don’t buy something unless you have an internal advocate who will stay with the deal and help it succeed; and don’t assume the acquired company knows how to make itself successful within Microsoft.